50 years -- And we're still here -- and still selling feathers! Gosh, it's hard to believe, but Trueflight was established and began selling feathers more than 50 years ago. Much has changed in those years, many businesses have come and gone, the compound bow went form zero to become a major part of the industry. The country has gone from player pianos to micro chips. Yet through it all people have maintained their interest and passion for the ancient art of archery. The basic idea of archery, the thrill of watching an arrow propelled by one's own effort arching towards a distant target hasn't changed. And the idea of using natural feathers to guide that arrow hasn't changed. In fact the ideal arrow guidance system for an arrow is still natural feather fletching. But how in the world did Trueflight wind up in the feather business? It isn't exactly the first thing you'd think of to write up on a business plan. I'd like to say it was the result of careful study and planning -- the truth is, it was more or less an accident. Just prior to World War II B. C. Roemer had gotten interested in archery. 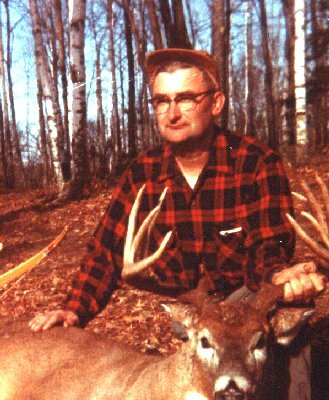 The first experimental archery deer seasons were just starting in his home state of Wisconsin. These were the "build it yourself" days -- virtually no archery equipment was sold commercially. B. C.'s schooling was interrupted by WW II. During the war B. C. worked on some of the newest "high tech" radios and radar in the Army Signal Corps. This training didn't much apply to archery, but B. C. did have a talent for making new equipment and solving technical problems. At the war's end, B. C. decided he would like to own his own business. The archery business looked promising -- there was interest in the sport, but a shortage of "buyable" equipment. His original intention was to manufacture a full line of archery equipment, using modern processes and tooling. Naturally the easiest archery item to manufacture seemed to be arrows. He decided to start producing them, but immediately ran into a problem. While raw shafts, points and nocks were readily available, feather fletching could not be found. No problem, B. C. thought. He set out to gather and prepare his own feathers. This turned out to be a bit harder than he imagined. Only a maximum of 2 or 3 feathers on each turkey wing were suitable for archery. And those good feathers were only to be found at a few turkey processing plants scattered across the country. Then as now, each feather had to be hand selected and hand clipped. Once the raw feathers had been gathered, they must be washed and dyed. Of course, no commercial equipment and dyes were designed for processing feathers. B. C. had to adapt and invent what he needed. Finally, an efficient way to grind a fletching base on each feather had to be found. This kind of machinery had never been made before. It took years of trial and error, clever designing, and more than a few trips to the local salvage yard to solve the problem. At last, B. C. could grind a good, consistent base on feathers. Archery was a small world back then. Word of B. C.'s fine feathers soon spread. A few friends asked for samples. B. C. agreed to sell a few feathers -- at least until he could gear up to produce arrows. "A few feathers" soon become lots of feathers. B. C. found himself occupied full time in gathering and processing feathers. Demand for feathers continued to grow, and B. C. never got the chance to produce any arrows. Strange as it is, despite the original intention Trueflight has never sold any completed arrows or bows. Processing feathers turned out to be a full time occupation. Over the years the basic machines and processes have been improved and refined. In fact "improvement" has been a constant effort for B. C. and all of the Trueflight people. Producing good, consistent feather fletching takes lots of very careful hand labor, specialized machines and skilled operators. Trueflight is still located in it's original small town in Northern Wisconsin. B. C. Roemer of course enjoyed the chance to go bowhunting "right out of the factory door". He succeeded in taking a beautiful Pope and Young whitetail just a few miles from the plant. B. C. Roemer also found time to invent and patent "Brush Button" brush deflectors. These rubber disks are used to keep brush from catching between the string and limb of re- curve bows and also help silence the bow. "Brush Buttons" may have been the first accessories ever sold for bows. B. C. also has several patents on other sporting related items. Despite it's isolated location, Trueflight currently sells feathers all over the world. "Word of mouth" advertising seems to work very well for Trueflight. Anyone who's seriously into archery -- in any country -- probably knows Trueflight's reputation for highest quality fletching. In 50 years many changes have come in archery. Many high tech materials have been developed in bows and arrow shafts. Yet, the "high tech" fletching is still natural feather fletching. "It is remarkable that in 50 years of "high tech" developments, the natural feather still has an unbeatable combination of properties making it the ideal arrow fletching. We're proud to be doing our part in making feathers available to today's archers, all over the world." -- B. C. Roemer, President of Trueflight Mfg. Co., Inc.
B. C. Roemer with Pope & Young 138 5/8" whitetail taken a few miles from Trueflight's plant in northern Wisconsin. All Trueflight feathers are gathered in US turkey processing plants, then washed, dyed, ground and trimmed in Trueflight's plants in Wisconsin or Nevada. This means that Trueflight feathers are completely produced under US law. From the USDA at the turkey plants, to the EPA, OSHA and state agencies, are continually under the scrutiny of US regulators. All of the dyes and chemicals we use are non- toxic and non-hazardous. They have to be. Our scrap feathers are recycled (under DNR supervision) to become crop fertilizer. Our waste dye water is treated at a municipal treatment plant, or 100% evaporated in a NDEP approved solar pond. Our plants are regularly inspected by the USDA, OSHA, state agencies and our own US insurance inspectors. All of this means that you can buy Trueflight feathers with confidence. You can be sure that Trueflight feathers are produced in a safe and environmentally friendly manner. Every part of our processing is done in the United States, under US regulations. Sign in auto dealership: "We cheat the other guy and pass the savings on to you." THE IRS READS THIS NEWSLETTER! On opening day of the 98 Archery Trade Show, Pam Oliveras stopped by our booth. Pam works in Washington DC and is in charge of collecting the FET tax on archery equipment. (And here we thought those Washington people only lived in our TV set.) It was good to talk with real people instead of being lost in Washington's voice mail twilight zone. Pam had read our description of the change in FET in our last newsletter. Yes, we had described the change correctly -- 12.4% FET is charged on all arrow components and paid by their manufacturer. Dealers assembling arrows from components owe no tax and don't need to file any FET forms. At least we understood that much of the tax law. However Pam pointed out that it wasn't quite right of us to imply that the FET funds were spent by the folks in Washington DC. The FET funds in particular, she pointed out, are only collected by the IRS. Once collected, the IRS sends them "un-molested" directly to state fish and wildlife agencies. These agencies are required by law to use the finds for fish and wildlife habitat, preservation, etc. If I understand correctly, the states are limited to using a maximum of 5% of these dollars for administration. I checked with the state of Wisconsin and discovered that last year our state received about 5 million dollars in FET funds. These funds were used in a great many different wildlife programs. I was disappointed to learn, however, that only about $100,000 had been spent on shooting ranges. Shooting ranges are specified in the FET laws as being one "target" for these funds. Anyone looking for help in establishing a public shooting range should definitely check with their state fish and game people. Some FET money may be available. If you have questions about FET collection you can contact Pam Oliveras at 202-622-4051. Questions about the distribution of FET funds should be directed to your state fish and wildlife agencies. Once again it's that time of year and as I reflect on this past year I realize how blessed I've been despite my occasional "not quite" successes. One of those blessings has been the opportunity to be employed and work for a person like Benjie Roemer. Benjie or B.C. as he prefers to be called, celebrated his 50 anniversary in the business of manufacturing the best Feather Fletchings in the world. WOW! What an accomplishment! I know Benjie well enough that I can understand why he has been such a successful businessman. I think it would of been better for me to call him a winner. Yes, I said winner, because you see over that 50 years, he had to suffer many losses. Some of them were enough to say the heck with it, but not Benjie. He does not know what the word quite means. The old saying "Winners never quit and quitters never win" I feel, defines the type of man that he is. In my opinion, to reach such an elite plateau it requires a person to be hard working, understanding, very determined, and open minded. All of these special traits are fueled by having a positive attitude. I can honestly say that I'm very proud to work for a man like Benjie and be a small part (20 yrs) of that 50 yrs. This was the year that I was going to catch that elusive 30# plus musky. Unfortunately, to date it has not happened. The one time we had a fish on that was in that size range, he made a strong run and crashed into the side of the boat. He broke my favorite musky bait and bent the remaining heavy treble hook. The Annual Wisconsin Bowhunters Necedah Shoot really deserves a pat on the back for a job well done. I seen the promotion of Archery with extra special consideration for the youth. The youngsters couldn't help but have a fun time just shooting arrows. In their 3-D area for kids only not only did they have 3-D deer targets, but they had dinosaurs to keep their interest and Imagination going. Now if that wasn't enough they also had an AMO Archery Alley set up. Talk about a ton of arrows flying. I had all I could do to get my 8 year old son out of this area. There must be well over 1000 participants, many of them are Families who camp on the park grounds and make a weekend of it. My hat is really off to all those who work very hard to make the annual Necedah, shoot such a big success. They surely had their "sight" on the kids. By the way if you haven't already use the new A.M.O. Archery Alley you might want to reserve it for your next indoor or outdoor events. It definitely will draw the kids in. I know I have my sights on using it at our next years Church Summerfest which caters to families. On behalf of all of our employees I would like to Thank you for your continued support thoughout this past year, it most certainly is appreciated by all of us. We are already looking ahead to next year for ways to improve not only our quality but also our delivery time. As always, I hope that all of your arrows hit their intended marks. Actually I didn't make the shot, the shooter was my 9 year old nephew. We were introducing Cody to archery and he was shooting a little kids bow for only the first or second time. Figuring I wasn't an expert archery coach (and for sure not an expert on 9 year olds), Cody's "lessons" were mainly on safety. We were working on "slow and methodical" and I didn't comment much on his shooting form. He was having a good time, but not shooting very accurately. After a while I suggested that instead of sighting along the arrow shaft, he might try just keeping both eyes open, drawing to the side of his face and in his mind picturing the arrow going into the bull's-eye. He said, "OK" and drew back as easy and confident as any experienced archer -- and put the arrow into his first bull's-eye. I suppose I should retire from coaching after that shot. But starting kids in archery is as much fun as doing the shooting myself. I'm always amazed at the way every kid wants to try shooting a bow and arrow. And once they've started it's hard to get them to take a break. I'm convinced that this is one of archery's great hidden strengths. This seems to be a natural instinct. Kids are "pre-wired" to be archery enthusiasts. All we need to do is make sure they have the opportunity to get started. For kids equipment we try to keep it real simple. We usually 4 fletch arrows so they don't need to worry about the orientation of the nock on the string. Arrows should be sturdy. We usually leave the shafts full length or cut to 28 inches. Even the simplest kids bow is enough to get them started. We like to start the target distances at 20 to 30 feet and put the emphasis on safety rather than accuracy. Text and Photos copyright 1998, Trueflight Mfg. Co., Inc.